Vendor Color: Distressed Brown. Comfort and tradition go hand-in-hand with this classically styled Sport Wide Square Toe Boot. Wide square toe. Box has minor dents. Boots are unaffected. Five-row stitch pattern. Purchased for $200 and have only worn a few times. Good condition. Ariat Men's Crossfire Western Brown Leather Square Toe Boots 10D. Condition is Pre-owned. Shipped with USPS Priority Mail. These are practically new, see pics. **I noticed a scuff on the toe-box of the left boot as seen in pic # 4. This is surface level and can probably be buffed out, I’ll try and buff it out. These are awesome boots. Only worn out a few times. Decided I like rounded toe look better. Get a great deal on these, they go for about $150 new. 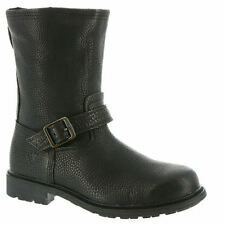 Style / Marked Size: Western Style Boots Size 12D. Model - Sport Wide ( 10010963). Construction/Features - Leather uppers,Rubber soles, Slip-on. Condition - Uppers are in very good condition. Soles and heels are in very good condition. NICE SLIGHTLY WORN MENS ARIAT ROUND TOE COWBOY/WESTERN BOOTS SIZE 13D. NICE SLIGHTLY WORN MENS ARIAT ROUND TOE COWBOY/WESTERN BOOTS SIZE 13D.. Condition is Pre-owned. Shipped with USPS Priority Mail. Ariat boots Sedona Mens Size 9D Black W/Silver Hardware. Condition is Pre-owned. Shipped with USPS Priority Mail. Pull on. Like new, no defects. Slight heel wear. 13" shaft, 2" heel. Rubber sole. Nice pair of Ariat Boots in men's size 13 D, style is Heritage Roughstock, made from grayish brown leather in varying shades. Heel measures 2" high and the boots stand 13.5" tall. They are in good used condition, quite a bit of creasing, scuffs & scratches, light normal wear on the soles & insoles but nothing excessive. There is some unraveling of the thread around a couple of the pulls (see photos). Overall, still some great life left in these rugged, quality boots. Style #34828. Great looking, quality leather boots made by Ariat. Used ARIAT XTR OVERDRIVE PULL ON COMPOSITE TOE BOOTS. Size 10.5D Very great shape. Composite safety toe protection. I am gonna say that these run ever so slightly small. I would say they're a roomy 10 or a tight 10.5. Comes with original insoles and extra insoles. Message me with any questions. Quick shipping to USA only. PayPal only,please. Thank for looking! Ariat Flex Pro 6" H2O. Innards are in very good condition. Loads of life left in these great boots. Upper Color: Matte Brown/Quill. Upper Material: Leather. Lining Material: Leather. Insole Material: Leather. 100% Authentic. 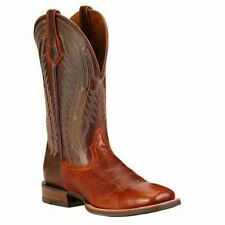 Ariat Heritage Roper Brown Men's Cowboy Boots, size 10 EE. Condition is Pre-owned. The heels have a few blemishes.These have definitely been worn but are still in good condition with plenty of wear still left in them. Shipped with USPS Priority Mail. Vibram outsole with exclusive Ariat design. Heavy duty, tempered steel shank. Outdoor traction lugs with debris-releasing tread. Safety toe is ASTM F2413-11 M/1/75 C/75 EH rated. Molded external heel protector. 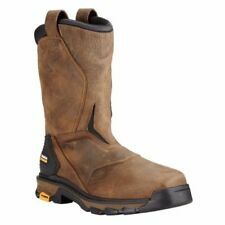 The next generation of work boot has arrived for the next generation work force. •Patented U-turn features a flexible panel allowing easy entry and exit for all foot shapes. •Wide Square Toe Shape. •Composite Toe. They are brown with a tan nubuck leather panel on the toes. Nice matching wxed laces. The bottom outsoles are flexible synthetic/rubber for comfort! Condition: These lace up ankle boots have wear consistent with average use to include: creasing across the toes, rubbing, scratches and dark areas. Ariat Work Boots. Men's size 11.5. Brown Leather with Stitched Shaft. MENS Ariat BOOTS Tombostone on good shape still long life ahead ..